FO: Kitty Hawk Mitts | Stitch, Brinn, Stitch! OMGWTFBBQ it’s a finished thing that isn’t shark mittens!!! Yarn: Sanguine Gryffon Bugga! in Oak Timberworm and Oleander Hawk Moth. Mods: None. Knit as written. So these mitts? Super freakin’ cute and steampunk-errific. Yes. I love how they came out and am sad I do not get to keep them (they’re for a WWFY swap). However? PITA to knit. There’s a bunch of rounds of reverse stockinette, and reverse stockinette does not play well with double pointed needles. I got some terrible laddering that was mostly covered up with a good steam block and the straps, but if you look closely, they’re still there. When I make these for myself, I think I’m going to flip ’em inside out. 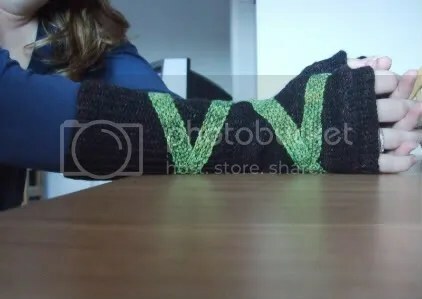 That way, I can knit stockinette instead of reverse stockinette and the patch thingy that comes out of the twisted rib will still stick out but I won’t have horrible joins. 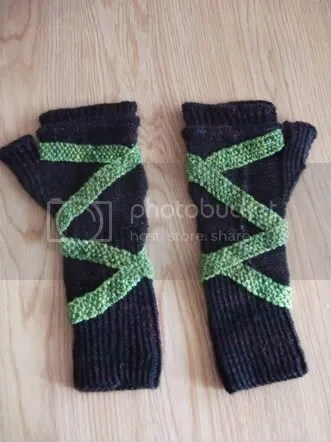 I’m also going to make them shorter (less ribbing, less plain knitting between the patch thing and the thumb gusset) cause it’s sort of a pain to wear long mitts under a sweater or long sleeves or whatever. That being said, it’s an ADORABLE pattern, and I love the finished result. I love how the finger ribbing is picked up a couple rows down so you get that two layered look. 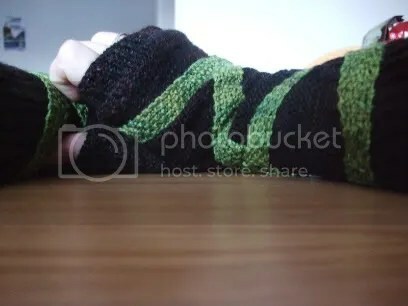 I love the twisted rib cuff (even if I hate knitting it). I love that patterned patch thing. I love the straps. I love the thumb. I seriously love these mitts. It will be a while before I get around to making them again for me, but when I do, I am going to love them. In other (non-knitting) news, my LAST SEMESTER OF COLLEGE EVER starts tomorrow. (At one cause I don’t do that early classes thing). I am both totally stoked and totally terrified to think about graduating at the end of the semester. So don’t be surprised if my blog attendance drops a bit while I get into the swing of the new semester. Cheers! FO: Kitty Hawk | Stitch, Brinn, Stitch!